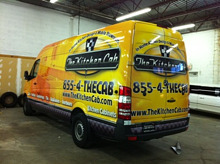 When it comes to kitchen and bathroom remodel contractors, The Kitchen Cab isn’t your typical contractor! As they boast, “The only kitchen store that comes to you!” they really mean it! They are the literally an in-home kitchen designer and mobile showroom.